Before producing our first prototype we had to cast for each of the characters that would appear in the prototype. This was a very interesting and complex process and is VERY overlooked in importance by the average entertainment consumer. This was my first time through this process and it was eye-opening. 1st – Our team defined each character as clearly as possible so we could post a casting call. We also defined the look we wanted for all live-action characters so only those fitting the description would submit inquiries. 2nd – We posted a casting call to a number of local agencies and craigslist. 3rd – Our team collected and reviewed 100’s of head shots, reels, voice samples, and resumes to narrow the number we actually invite to the casting session. 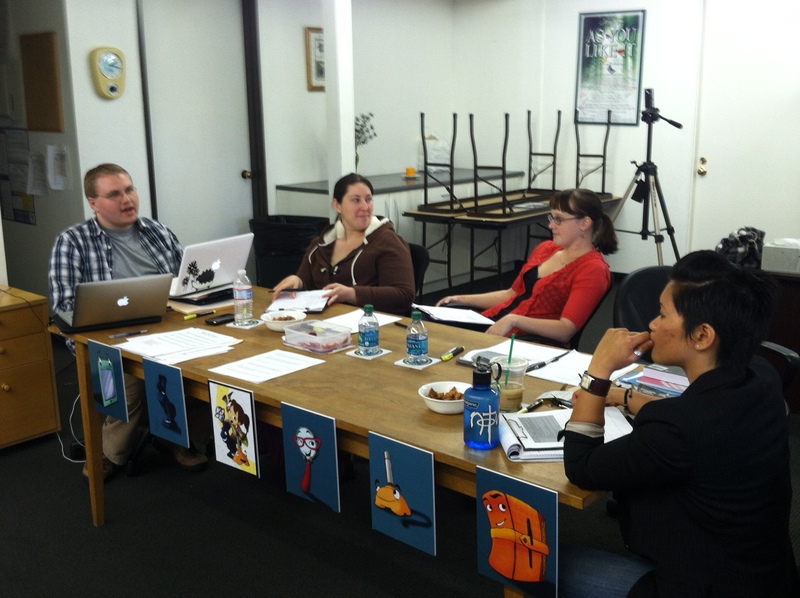 5th – Our panel met to discuss what we were looking for in each of the live-action characters and character voices. This was more difficult than I had expected. Although we had character definitions we still had to establish how that character might manifest or sound in a real person. We used these established observable characteristics to set up a scoring sheet. 6th – We auditioned 10-15 individuals for each role and voice. Our director gave direction to each actor to see their ability to revise the performance based on direction. This also gave us the chance to see a general range of each actor. 7th – After each audition, we discussed our scores and notes (which represented our thoughts and feelings about each actor) for each observable identified characteristic. Interestingly enough it was not always quantifiable observations, but general feelings and impacts of auditions and voices that convinced us one way or another on each actor. 1st – As a team, we learned a ton about not only this process, but about the depth to which we needed to KNOW our characters. 2nd – Although this process is straightforward, coming to consensus on who and why was VERY difficult. Some of this came from a still ambiguous perspective on each character’s voice. Some of this came from limited choices. Still some came from the limited experience by each person at the table. 3rd – We only had one casting session. While most casting brings the top few candidates back to read with others to observe chemistry and sound of a mix of voices, we made decisions all in one day after one single audition. I would do this differently next time as I’m not sure the chemistry of our voice selections was spot on. Any other thoughts about casting – please share.